A convenience store in Salem that serves a range of fresh Middle Eastern food? It sounded strange, but so many people raved about it, we were more than intrigued. Located a half-block from the main Salem State campus, the White Dove appears to be an ordinary corner store, but the food we sampled was far from the typical deli fare. We ordered the chicken kabob, falafel, shawarma, and kafta kabob sandwiches. 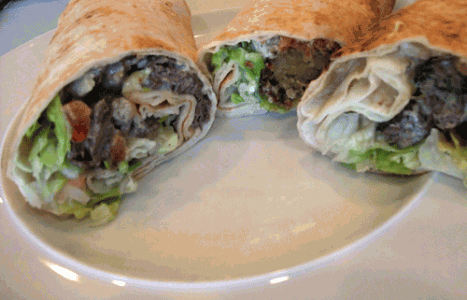 Each came rolled in extremely fresh, soft pita and would easily feed two people. The falafel was tender and flavorful; the chicken was fine but not outstanding. The shawarma (thin slices of marinated beef cooked on a rotisserie) was marvelous, with a lemony tahini sauce. The kafta was equally good: small charred meatballs of beef and lamb highly flavored with herbs, spices, and onion. We bookended our sandwiches with some baba ghanoush and a piece of baklava. Both were fresher than we’ve had elsewhere and made with care. The baba ghanoush was a creamy smoky revelation. We don’t have individual prices for the items (and they’re not on the website), but our entire meal cost $32 and constituted enough food for eight people—although you’d probably want to add one more piece of baklava to avoid any dessert disputes. Thanks for the recommendation of this place. Shwarma’s a great and the pizza is my new favorite on the North Shore. You rock as usual.